A man who seems to do nothing but get better at his already impressive skills, Mike is one of the top competetors in Alberta. 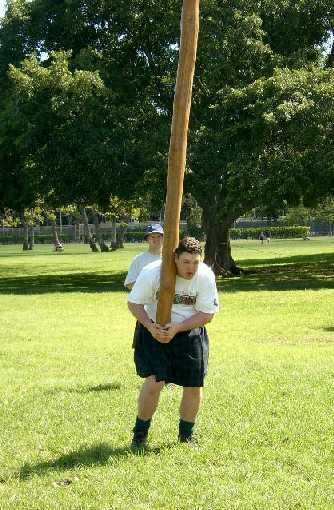 He also took a solid 3rd place at the 1998 Alberta Strongest Man Alive contest, and continues to demonstrate his enormous strength at any opportunity. 28lb weight for Distance 65'9"
56lb weight for Height 14'6"
Hammer Throw - 16lb 115'2"
Hammer Throw - 22lb 94'6.5"
Another man who helped found the Games in the past few years, Gord has been a trained athlete for years. A technician in the purest sense of the word, the native of Newfoundland always pushes everyone around him to try and keep up. There isn't an event in the games that Gord does not excell at. 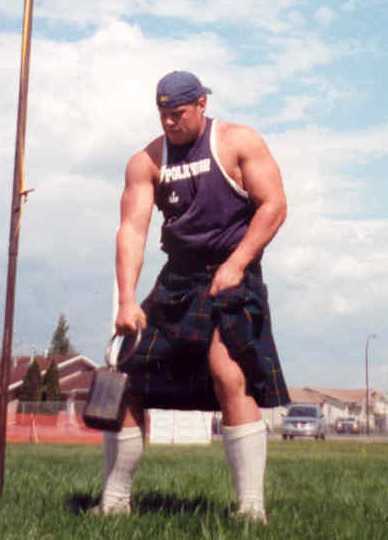 28lb weight for Distance 68'2"
56lb weight for Distance 33'3"
56lb weight for Height 14'"
Hammer Throw - 16lb 120'6"
Hammer Throw - 22lb 100'1"
Bob was another of the sudden inrush of excellent athletes we received in 2002. Showing both a desire and ability to learn, plus an enormous amount of upper body strength, he's quickly risen to one of the top amateurs in the province. 2004 proved to be an extremely successful year for Bobby as well, being kept out of the open class by a single event only. 28lb weight for Distance 55'6"
56lb weight for Distance 28'2"
56lb weight for Height 11'6"
Hammer Throw - 22lb 72'8"
As the only Englishman in the group, Terry takes the teasing he almost continuously gets in stride. With an impressive amount of strength in last second accelerations, Terry is another athelete who seems to do nothing but improve. Although living near the centre of the universe (Toronto), we still get to see him out for a few competitions each year. We don't let him throw as a master, though. 28lb weight for Distance 51'2"
42lb weight for Distance 37'4"
56lb weight for Distance 26'6"
56lb weight for Height 12'6"
Hammer Throw - 16lb 97'2"
Hammer Throw - 22lb 71'6"
Sheaf Toss - 16lb 25'5"
Sheaf Toss - 20lb 22'6"
Trimmed down and much improved on his speed and agility, Blaine joined the Open ranks in 2001 and is a continuing force in the games in Alberta. Coupled with his looks is a world class sense of humour and showmanship, which makes him a favorite of the crowd and the other athletes. 28lb weight for Distance 60'10"
56lb weight for Distance 30'8"
Hammer Throw - 16lb 85'3"
Another very large man, Todd has been extremely successful in the arena of hand strength and overall body strength. As he picks up more and more fluidity in the events, he should be able to use all that mass to his advantage in the games. 28lb weight for Distance 45'3"
56lb weight for Distance 20'6"
Hammer Throw - 16lb 84'5"
Hammer Throw - 22lb 63'1"
Our very first junior athlete, Graham started when he was barely 15 years old. Throwing at a stage where he's usually outmassed and out-aged by a considerable amount, he has nonetheless managed to improve in leaps in bounds in every event. His youth is going to prove his biggest asset in times to come, as he will more or less be growing up around the implements and will improve as his strength, size and experience naturally do. 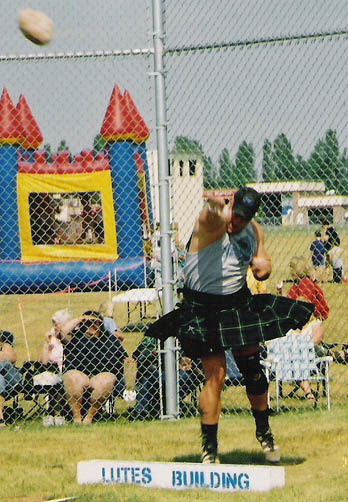 28lb weight for Distance 36'4"
42lb weight for Distance 25'3.5"
42lb weight for Height 11'6"
Hammer Throw - 16lb 71'4"
Hammer Throw - 22lb 58'3"
Big Wes is another member in the Mecca of Highland Games in Alberta: Beaumont. Wes jumped in with both feet and immediately fell into a rivalry with Dangerous Dan Loeb. Even going so far as taking his family to Disneyland just so he can throw in California, Wes promises to extend some already respectable early numbers in 2007. 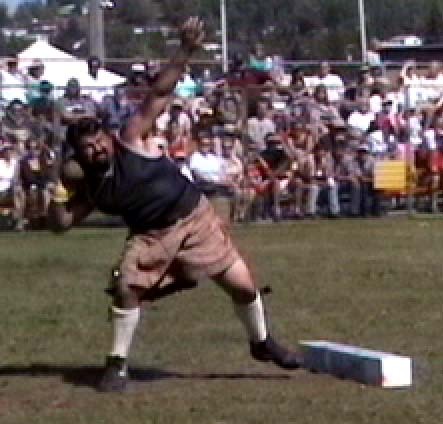 28lb weight for Distance 49'5"
56lb weight for Distance 23'6"
Hammer Throw - 22lb 56'5"
A good sense of strength and training philosophies akin to the old style of training in the Iron Game are going to take this vertically challenged athlete a good way into the Games. In addition to these little benefits, there appears to be something in his mental makeup that prevents him from walking by any odd shaped object without at least taking a crack at the lift. 28lb weight for Distance 44'3"
56lb weight for Distance 22'10"
Hammer Throw - 16lb 88'3"
Hammer Throw - 22lb 67'9"
Old enough to be at least one other member's father, Tim has really turned it on this year, improving greatly on his technique and his raw power and aggressive stance toward the events. The numbers will continue to climb as he fine tunes every event. 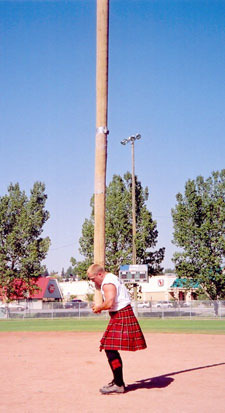 56lb weight for Distance 20'7"
Hammer Throw - 22lb 58'2"
Although the highland games is an offseason sport for this football player, turned powerlifter turned olympic lifter, 2002 has shown his breakthrough year as he puts all of his athletic ability and kinesthetic sense to use, offsetting the weight difference between himself and many of his competitors and throwing at the top of the B list. 28lb weight for Distance 53'7"
56lb weight for Distance 26'5.5"
Hammer Throw - 16lb 92'.5"
Hammer Throw - 22lb 70'1.5"
Dave hit his first season hard, hammering out very respectable distances almost immediately due to an enormous amount of power. Deciding to kick that advantage up even further, he trained constantly for the events all during the season and managed to put his numbers very near the open class limits. With his second year coming up, it's extremely doubtful that he'll be in the amateur B class for much longer. 28lb weight for Distance 57'11"
56lb weight for Distance 30'4"
56lb weight for Height 13'6"
Hammer Throw - 16lb 94'5"
Hammer Throw - 22lb 73'11"
Ft. Ed Stone - 95lb 11'11"
Matt came onto the scene an accomplished track and field athlete and immediately set about showing people what that kind of training can do for you. 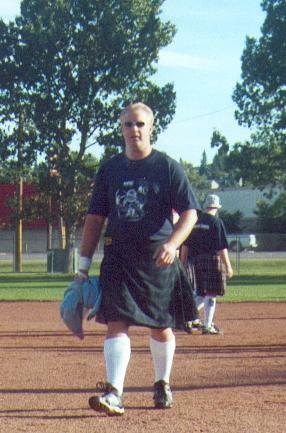 After one games, he managed to qualify as an open class athlete and set a number of field and provincial records. 28lb weight for Distance 59'1"
56lb weight for Distance 24'10"
Balancing that ugly area between pushing up his raw strength and embracing his inner gear whore, the 2006 110kg Alberta Provincial Powerlifting champ unfortunately doesn't come out and play nearly as often as he should. He is a Sagittarius who enjoys BBQ, moonlit walks and July Garland movies. His turn-offs are negative people and anything to do with Paris Hilton. 28lb weight for Distance 35'3"
56lb weight for Distance 17'2"
Hammer Throw - 16lb 74'1"
Hammer Throw - 22lb 53'8"
Coming to us from professional rugby, Ryan had an immensely solid first games weekend with a combination of strength, explosive power and an obvious ability to learn complex movements very quickly. 28lb weight for Distance 46'3"
56lb weight for Distance 21'6"
Hammer Throw - 22lb 63'5"
One of our neighbouring athletes from Saskatchewan, Neil still makes the 8 hour trip to come and play whenever possible. 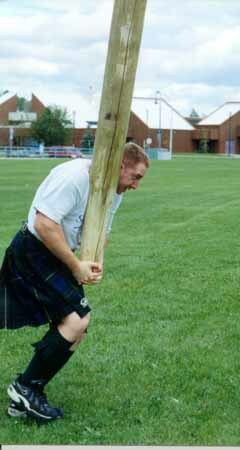 New at the games and a mountain of a man, Neil has time, patience and determination on his side. 28lb weight for Distance 51'7"
Hammer Throw - 16lb 91'4"
Hammer Throw - 22lb 64'9"
Kelly jumped into the sport with both feet, rapidly picking up both equipment and proper dress and trains consistantly for all the events, as can be seen from his almost constant improvement. Having the same warped sense of humour as his cousin Blaine, he is also a major source of entertainment among his competitors. He has established himself as one of the forces to be reconed with in the amateur B ranks and is steadily pushing closer to the A numbers. 28lb weight for Distance 47'9"
56lb weight for Distance 23'4"
Hammer Throw - 16lb 87'3.5"
Hammer Throw - 22lb 66'11"
Another of those track athletes, Marc is actually from Manitoba, but its always a treat to have him do a little travelling to come and play over here. In 2001, Marc went pro and did it with style. 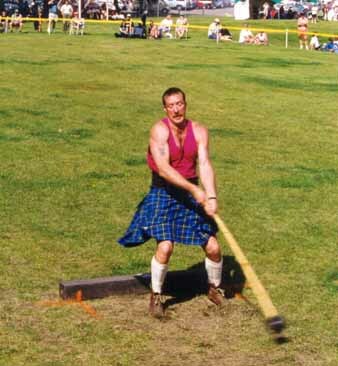 Now focusing on the highland games, his numbers are climbing steadily as he secures his place in the top ranks in Canada. 28lb weight for Distance 67'9.5"
56lb weight for Distance 34'9.5"
56lb weight for Height 12'4"
Hammer Throw - 22lb 97'8"
Sheaf Toss - 16lb 30'4"
Although 2000 was Joe's first season, he's shown remarkable talent, taking to the games quite naturally. 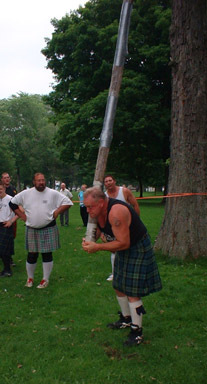 In addition to the heavy events, Joe is slowly gathering experience and strength for his career in the field of strongman. Much more recently, Joe has earned the right to be considered a full Amateur A athlete, doing so in near record time and rising to the challenge, putting up bigger numbers in almost every competition. 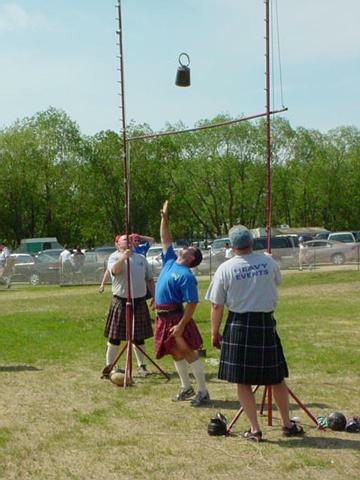 28lb weight for Distance 61'4"
56lb weight for Distance 28'9"
Hammer Throw - 16lb 104'4"
Hammer Throw - 22lb 82'4"
Dave came out for his first competition in High River, managing to take the division immediately. Now having caught the bug, Dave looks to have a long and promising career in the games. 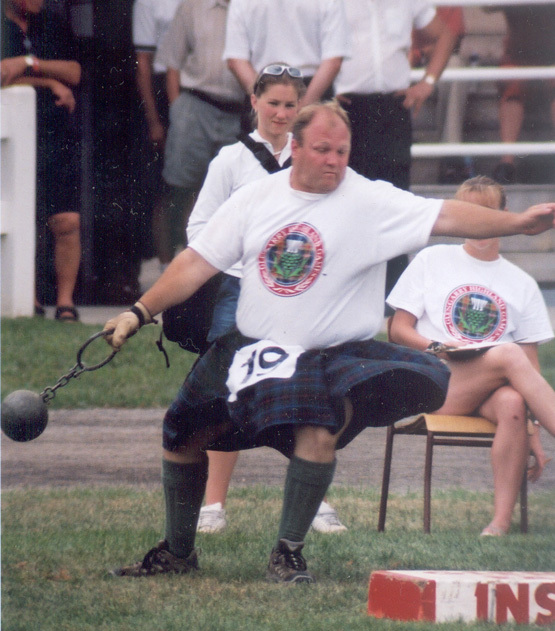 With a couple of spectacular performances early in 2002, Dave got and accepted the invitation to compete in the Open class where he continues to improve steadily. 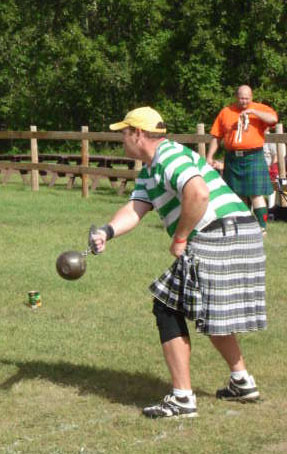 28lb weight for Distance 61'11"
56lb weight for Distance 32'6"
Hammer Throw - 16lb 95'8"
Hammer Throw - 22lb 74'5"
Paul joined the association for a few games in 2004 and started joining the more regular north crew in 2005. Already much smoother and more confident, he can expect some big improvements this year. 28lb weight for Distance 37'1"
56lb weight for Distance 18'6"
Hammer Throw - 16lb 64'11"
Hammer Throw - 22lb 48'3"
2004 was a real breakout year for Jim. With only two full seasons under his belt and a decisive victory in the provincials, Jim moved up into the Open class and has continued to improve steadily from there, rapidly becoming a solidly competitive member of the class. 28lb weight for Distance 62'3"
56lb weight for Distance 33'9"
Hammer Throw - 16lb 94'2"
Hammer Throw - 22lb 74'4"
Ft. Ed Stone - 95lb 12'9"
Andre joined up late in 2004 and proceded to throw himself into the mix immediately. Bringing some natural athleticism to the games, Andre will no doubt rise in the ranks as his experience increases. Hammer Throw - 16lb 68'1"
Hammer Throw - 22lb 49'4"
At first glance, Mike does not seem to possess a typical thrower's body. 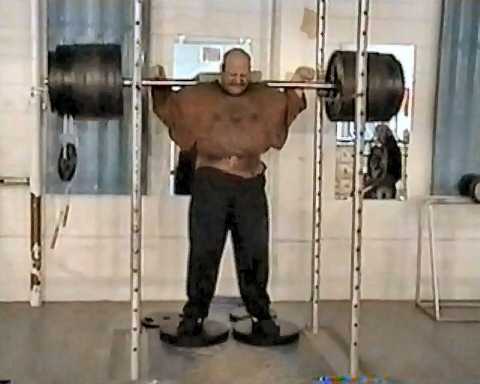 However, underestimating the man would be a huge mistake, as he is a master of last second accelerations, snapping the weights out much further than you would expect for the few games he has attended. Natural explosiveness aside, he has also taken the games seriously and is already working to improve his technique. 28lb weight for Distance 46'6"
56lb weight for Distance 20'3"
Hammer Throw - 16lb 86'8"
To say Jason has had an explosive entrance is an understatement. From his first games in 2005 in Regina to the next games he went from a very good B competitor to one of the best ranked athletes in Canada. With the upcoming 2006 season on the horizon, he is looking more and more like one of the athletes to beat in Western Canada. 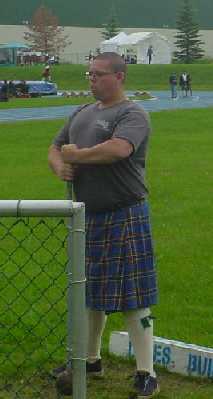 28lb weight for Distance 67'5"
Hammer Throw - 16lb 108'1"
Hammer Throw - 22lb 85'9"
Well...its me. I'm out there every opportunity I have, and have had the opportunity to throw all over and against the world's best. Not saying that I can hang with them, just that I've been beat by them. 28lb weight for Distance 69'3"
56lb weight for Distance 35'3"
Hammer Throw - 16lb 105'6"
Hammer Throw - 22lb 84'7"